I've added reprocessed images from G1 and E26 to my Galileo Images website. 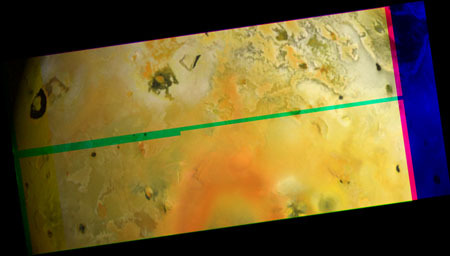 The G1 images from late June 1996 are global views that represent that highest resolution views of Io's surface since the Voyager encounters of 1979 and allowed scientists to examine changes to Io surface in the intervening 17 years. These include changes at Pele, Acala Fluctus, Euboea Fluctus, Fjorgynn Fluctus, and Ra Patera. Two of the sequences from G1 were designed to look for plumes at Loki and Aten; instead plumes at Ra Patera and Masubi were observed. The E26 observation from January 2000 is the highest resolution color observation from Galileo covering the trailing hemisphere of Io. This includes Loki, Daedalus, and the northern half of Pillan. This isn't a widely-known observation. As far as I know, the whole image was not released publicly by the project, though a composite showing color changes was available (I think). These images are then converted from the original PDS format to the ISIS format. ISIS is a spacecraft image processing software suite produced by the Astrogeology department at the United States Geological Survey branch in Flagstaff, Arizona. The ISIS software package will definitely be the subject of future posts in the form of image processing tutorials. This step includes the pds2isis, gllfixlabel, and levinit procedures. These convert the original raw files to ISIS, correct the original labels to work with ISIS software, and apply geometry backplanes to the images, respectively. For now, the geometry applied by the levinit program assumes the default SPICE kernel files are correct (which may or may not be the case), but in general, since I've only reprojected one of these observations so far, any discrepancies haven't mattered. The ISIS procedure ssical is used to calibrate each image and to convert the pixel values from the 8-bit DN values to 16-bit I/F values. This allows me to ensure that each color filter image is scaled the same when I convert them to TIF and merged to create proper color images. The edges of each image are trimmed to remove edge effects. Several instances of the ISIS procedure boxfilter are run to clean up noise. Due to the enhanced charged particle environment at Jupiter (and Io in particular), bright pixels can show up at random locations. This steps helps to remove those pixels and fill them with an average of the surrounding pixels. The standard deviation used in boxfilter is adjusted (usually between 1.3 and 1.9) depending on the Signal-to-Noise ratio of the image. In general, close-up images of Io or images from later in the mission are noisier than distant images or images from earlier in the mission. The cleaned-up, calibrated images are converted to TIF using the ISIS procedure isis2tif. The images are scaled so that the pixel value 255 is equal to the brightest pixel in all three images used in a color composite. The images are then merged into a color composite or a mosaic in Adobe Photoshop CS. They are then rotated so that north is up. Sometime this week, I hope to have some time to work on the images from G2 and E4, though with a Titan flyby over the weekend, I'm not sure I will have the spare time.